Mavis is waiting in her car, wearing a pair of sunglasses like Audrey Hepburn. I notice she's also got on her yellow cardigan and the blouse with the embroidered collar she saves for special occasions. And her pearl earrings, to boot. "Aren't you just a picture," I say, taking my time to climb in, stowing my cane in the back seat. "Why thank you, Betty, dahhling," she says. At the restaurant it takes us ages to get settled into our booth because I'm slow on account of my bad hip, and Mavis isn't so steady on her feet these days either. Once we're seated, I notice she's still wearing those glasses. "You worried about paparazzi, Mave?" "Always," she says and leaves them on. We get the usual: two cheeseburgers with extra pickles, two milkshakes (hers strawberry, mine vanilla) and a large order of french fries. When the fries arrive, I dump them onto the paper lined tray. I bite the tip of a packet of ketchup and tear it open with my teeth. 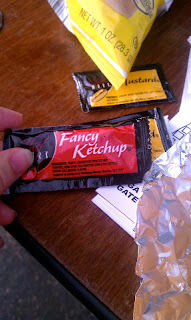 It says: "fancy ketchup," but it's the same as all the other ketchups. Still, it's nice to have the suggestion of class. Like those sunglasses. I squirt a little dollop onto the paper. Mavis does the same on her side of the tray. We're quiet for a moment, performing this little ritual. Mavis and I have been meeting for hamburgers on Sunday afternoons since we were seventeen. Can I say something? These afternoons with Mavis, without our husbands when they were still alive, or our children, before they got lives of their own, were some of the best times I ever had. "How are you, Betty?" she asks. "Can't complain," I say, licking salt from my fingers, "but I probably will. Would you take those cotton-pickin' things off now?" When she does, it finally hits me why she insisted on wearing them. Mavis's eyes have never been able to hide a thing. She looks at the fries for a long time and when she speaks, she speaks to them. "It's just that my cancer's come back. And it's inoperable this time." I'm searching for something to say, when Mavis starts to cry. And an old face like hers crying is just about the most pitiful thing you could ever see. It's like a building falling over. So I do the only thing I can think of. I take the fancy ketchup and I squirt the whole packet onto my face. She pauses for a moment, staring at me and then she starts to laugh. And I join in, both of us laughing through our tears. I love your stories Brittany. Thank you for giving my day a lift.